We associate colours and tastes to such an extent that we mix them, speaking of lemon yellow, lime green, tangerine, plum red, chocolate brown and so on. In fact, many of the characteristics we ascribe to a certain tone, such as fresh green or deep burgundy, are at least in part drawn from the foodstuff they remind us of. Naturally there are also variants, such as white chocolate, green tomatoes and brown rice, but while we have grown used to these it feels odd to stray too far from the combination of tones and flavours that have become engrained in our brains, as well as our eyes and taste buds. This connection is so strong that a certain colour can conjure up associations with taste groups, such as citric fruits, or even specific flavours such as orange or lemon. The reverse is also true, ensuring that we would struggle to enjoy a strawberry flavoured drink if it was brown. 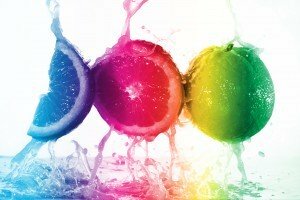 I imagine I would have trouble convincing you to try – and enjoy – green orange juice or blue wine, but imagine a world in which all our known colour and taste associations would be randomly turned on their head. It might just prove to be the best diet plan ever conceived. These three senses form a central part in our everyday existence, with taste and smell directly related through the interaction of nose and palate. We might think that we smell with our noses and taste with our tongues, but in reality both the perception of flavour and fragrance are the product of a chemical reaction detected by specially designed receptors to which each organ contributes. What we discern in this way has been categorised into the seven basic tastes: sweet, sour, bitter, salty, savoury, piquant and metallic. Combinations of these exist, increasing the range of options available to us, but it is above all through endless variations of smell that we can significantly widen the range of possibilities as used by the world’s food industry. Manufacturers of soft drinks and ice creams conveniently change the smell of their products without having to alter the actual flavour much, a process used extensively in a field where the natural content of strawberry or pineapple is often replaced by nature-identical flavour compounds whose chemical structure is a synthesised, manmade replica of the original. Thus produced a raspberry drink need not – and often isn’t – purple red, as the natural juice would be, yet to make their products acceptable to consumers food companies add colorants that return the juice, yoghurt or pudding to its familiar tone. They have to do this because of the third element in our sensory relationship with food – sight. The most conceptual and psychologically based of the three, sight influences the mind when you eat something, feeding information to the brain that can trick us into believing that what we’re eating or drinking tastes different, when it doesn’t. Adding green to beer or a fruit juice will often make it appear bitter, lemon introduces a sense of fresh, citrus-like acidity while a burgundy tone will imply a deeper, mature sweetness. The function behind this visual role is largely a protective one, in which mankind has grown to associate certain characteristics with certain colours and allowed himself to be guided not just by his nose – as in detecting food that’s gone off – but also by his eyes. Brown tones are often a warning that something’s past its best, while we are generally speaking turned off by inorganic colours such as blue or grey. Our eyes therefore remind us what a certain foodstuff should taste like even before our tastebuds have had the chance, and when the two messages conflict it creates a sense of confusion that turns our sensory world upside down. Can one adapt to unusual taste and colour combinations? 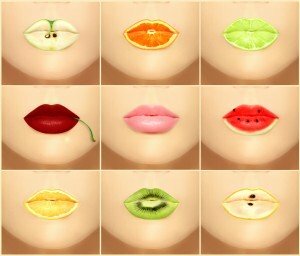 Certainly, but our natural tendency to group them in familiar patterns not only serves to enhance our sensory experience but also protects us, so as food manufacturers have discovered it is best not to get too creative and allow us to engage all three senses when we tickle our tastebuds. This article is featured in the March 2015 edition of Essential Marbella Magazine. This entry was posted on Friday, March 27th, 2015 at 2:24 pm	and is filed under Art, Environment, Food & drink, Freelance Writing. You can follow any responses to this entry through the RSS 2.0 feed. Both comments and pings are currently closed.